Jyothi struggled out of a life filled with hunger and frustration to set up a software company worth millions. Swathed in sweat, the pale pink tattered cotton sari clung to Anila Jyothi Reddy’s slim frame. Bent over in the rice paddy field, the 19-year-old farm labourer was painstakingly planting paddy saplings in her village in Warangal district of Andhra Pradesh in southern India. She couldn’t decide what was worse – the sweltering sun, the leeches sucking the blood from her toes or the pangs of hunger because the last meal she had was a day ago. Her misery doubled whenever she glanced at her little daughters – two-year-old Beena and six-month-old Bindu – who were crying of hunger on a patch of land near her. She knew that after toiling for over 10 hours all she would receive as wages at the end of the day would be a meagre Rs5 (30 fils) – barely enough to feed her girls. Born in a poor farmer’s family and married to a poverty-stricken farmer, hunger and desperation were not new to her. And she knew that would be her daughters’ fate too. And then something snapped inside the young woman. Dejected with life and overcome with frustration, she moved towards a well nearby. ‘This is the end of the road,’ Jyothi told herself. Depressed and with dark thoughts clouding her mind, she peered into the 200-m-deep well, ready to jump in. At just that moment, the sharp cry of hunger from her toddler broke her chain of thoughts. She paused, looked at her children, then broke out in tears and ran towards them. Although the incident occurred 25 years ago, Jyothi still shudders as she recalls the day, which triggered in her a desire to chart a new path and change her destiny. Jyothi with her daughter Bindu – the entrepreneur credits her daughters with giving her the will to live. Today, the 46-year-old woman is the CEO of a $15 million (about Dh55 million) software recruiting company she launched in 2001 – Key Software Solutions – in Phoenix, US. Living a comfortable life with her daughters, who are both engineers, she is also doing her bit now to change the lives of poor women in India. This meteoric rise to success might read like a Hollywood script, but for Jyothi it wasn’t quite as simple. Now Jyothi regularly meets with leaders around Asia to discuss the cause of orphan children, always updates her 33,000 Facebook followers about the several initiatives she undertakes, and makes frequent visits to India to deliver motivational talks. ‘I got more than I set out to achieve,’ Jyothi tells Friday over telephone from her office in the US. ‘Now I want to give something back to society.’ From a young age, Jyothi harboured dreams of making it big. Jyothi’s father sent her to an orphanage when she was nine, where instead of wallowing in misery she worked towards getting educated. Father Venkat Reddy, a farmer, and mother Saraswatiamma struggled to raise their five children – two daughters and three sons. Jyothi was their second born. Venkat’s monthly income of Rs400 was barely enough to bring food to the table. ‘We’d survive on two meals a day, wear torn clothes, had no footwear and lived in a thatched hut with no electricity,’ Jyothi recalls. When a drought worsened his financial condition, Venkat decided to admit Jyothi, then nine, and her seven-year-old sister Vijaya Lakshmi, to an orphanage – the Bala Sadanam, in Hanamkonda, Warangal. Her sister Vijaya was inconsolable, and when even after several days she could not adjust to orphanage life, the authorities requested her father to take her back. Jyothi decided to continue there so she could earn a decent education. ‘I’d get three square meals plus I had the option to study, so I decided to stay back,’ she says. Jyothi protested and pleaded with her family that she wanted to study, ‘but they said they’d given their word’. The work was tough. She had to be up at dawn, cook breakfast for the entire family, then work in their own fields as well as on others’ fields for paltry amounts. Her in-laws and her husband also worked on fields, but their combined income was not enough to get three proper meals. By 18, Jyothi had two children. ‘It was really tough raising the kids and working on the fields,’ she says. To make matters worse, her marital life was not all that rosy. ‘My husband and I quarrelled often, and I was feeling extremely frustrated and dejected in life,’ she says. And then came the day that changed her life, in early 1989. Jyothi with the late indian president Abdul Kalam. As a champion of children’s and women’s rights, she regularly meets with various VIPs. When the bickering at home worsened, Jyothi decided to move out with her daughters. ‘I wanted to carve a path for myself,’ she says. On May 21, 1990, the mother and daughters arrived in Hanamkonda, a small town. ‘All I had was two saris, a few clothes for the kids, a bag of rice and a few pans,’ says Jyothi, who still had her job that now paid her Rs190 a month. Jyothi rented a room for Rs60 per month and enrolled her daughters in a local school. ‘It was a tough life and I often wondered whether I’d taken the right decision. ‘There were times when I’d rummage through garbage bins for discarded vegetables, clean them and cook food for my kids with them,’ she recalls. Meanwhile, she enrolled for an online graduation programme and when she completed it, got a job as a teacher in a high school. Her salary was a respectable Rs6,000 and her lifestyle improved marginally. She also enrolled for a master’s degree and two years later was a proud master’s degree holder in sociology and public administration. With education came promotions, and in 1998 she was made girl-child development officer. Her job involved setting up early childhood centres and village playschools. Then a chance meeting with a cousin, Jaya Lakshmi, who lived in the US and was visiting her town, changed her life again. Her cousin promised to help her and with the help of a friend’s brother who ran a software company in California, she secured a visa to the US. In May 2000 Jyothi boarded a flight to San Francisco, bidding a teary farewell to her daughters, who stayed back in a residential school as Jyothi had decided she would not disrupt their lives. 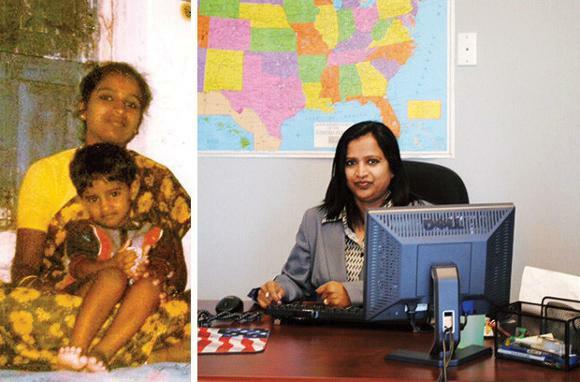 In the US, Jyothi applied for programming jobs, but not finding much success started doing odd jobs – ‘helping in a cassette shop, babysitting at times and even working at a gas station. ‘I also began watching a lot of TV serials so I could pick up English as I wasn’t fluent in the language.’ After several odd jobs, she finally landed one as a recruiter in a software company in South Carolina. A year later in 2001 she visited India to see her daughters and relatives. ‘One well-wisher suggested I become an entrepreneur,’ she says. Back in the US after the vacation, Jyothi did some research, and set up a software recruiting firm. ‘I found there was a huge market and with my savings of $40,000 (Dh146,900) I rented a small office in Phoenix, Arizona, and set up my company called Key Software Services in October 2001,’ says Jyothi. She hired two employees and ‘put my everything into it’. The hard work paid off. Today Key Software has over 200 employees and an annual turnover of $15 million. Jyothi brought her daughters to the US and enrolled them in universities for engineering degrees. ‘I had a tough life. But I didn’t want to give my daughters the same miserable life. This thought drove me to achieve unthinkable goals and overcome the challenges that came my way,’ she reminisces. Then Jyothi decided it was time to give back to the society. Her early days in the orphanage had sensitised her about the cause of orphans living in India. ‘There are millions of orphans living in India. I want to give them an identity and enlist more support from the government for their needs,’ she says. A champion of women empowerment, Jyothi has spoken about her inspirational journey at various schools, colleges and forums across India. ‘I tell women to be independent; they should not consider marriage as the end of their life but only a part of their life,’ says Jyothi, whose biography titled Aina Nenu Odipoledu (Yet I am not Defeated) has been published in Telugu. Her life’s journey has also been included as a chapter in the English textbooks of Kakatiya University, Andhra Pradesh. Jyothi’s is confident her motto – you are the creator of your own destiny – can become a life mantra for everyone.